I admit, I'm a Halloween scrooge. Last year I complained about dressing up young children and pets and the cruelty that entailed. This year I would like to complain about Horror films. Whether it's for the low cost of horror film mixed with the decreasing intelligence of those with disposable income, horror films are a good bet for profitability. In fact, there's films like this years Paranormal Activity, compared to 1999's Blair Witch Project for it's low budget and incredible theatrical success that spells out P-R-O-F-I-T. And lots of it. Horror films rarely cross the 100 million domestic gross line, but they don't need to. The cast and corn-syrup blood budget is low. Horror movies have been around for awhile, but the pure explosion of new horror films being released month after month seems like pure insanity. Are American teens so numb that they need to find such an extreme emotional experience in films that deal with brutal death, torture, and deep irrational fear? 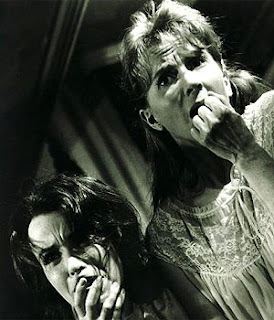 This years been filled with horror flicks with relative success...My Bloody Valentine 3-D, The Haunting in Connecticut, Friday the 13th, The Final Destination, The Unborn, and Orphan. Not to mention Saw 42 or whatever number they are on. The list could go on. And so when Halloween comes around people want a scary movie. Hello, there has been scary movies all year long. This is not just a Halloween phenomenon. So if scary movies were ever intriguing to me, they seem like utter trash now. I have a hard time getting into the excitement behind success of small horror films, because you make a thousand small horror films a few seem like they're going to make it. You've heard it said it takes 10 compliments to take away 1 mean remark. Well even if you argue for any redemptive moment in any of these films, there is far too many dark and unredemptive images, ideas, and scenes to even begin to justify the one message that some of these films may have. So if you're watching some modern slasher horror this Halloween, go for it. I might consider something smart not gory, like Whatever Happened To Baby Jane? or Pyscho. But as for me - this year I'm hardly even interested in a horror film, the genre is exploding in all the wrong ways. In conjunction with my humble Oscar predictions for best supporting actress, I now present my best supporting actor predictions. Unlike the Academy Awards' supporting actress race, somehow, things seem clearer, and while buzz and sentiment can change, their isn't the same types of issues regarding internal competition that make the predictions challenging. I've been reluctant to post any supporting actress nominations, so we're here in October and I present to you my first round of Oscar predictions in this category. My reluctance comes primarily from the internal competition discussed earlier this month. A Single Man: Fashion designer Tom Ford directorial debut is a book adaptation about a gay British college professor (Colin Firth) who after the death of his partner tries to go through a typical day in Los Angeles. The films technical staff involves many of the artist between the sets and props of AMC's Mad Men. A Serious Man: The Coen Brothers is the black comedy set in 1967 Minnesota about a Jewish family, primarily Larry Gopnik (Michael Stuhlbarg) a physics professor who's life is falling part and who is having a spiritual crisis of belief. Common Theme: Both films take place in a similar era, both focusing on professors who feel isolated as they experience loss. Both will likely receive critical praise and awards attention, and both have relatively boring and generic titles. Not the same: LA vs. Minnesota and gay vs. straight. Not to mention both films will undoubtably have a very strong style judging from reviews and previews, but those styles and artistry have their own flavors. In my recent post on teen films I discussed how I think teens have a better chance of establishing strong careers by performing in teen oriented films over prestige films. One of the actresses who I think has done an incredible job at sticking in the Hollywood game after a childhood success story is Anna Paquin. 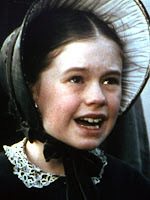 Anna Paquin became the second youngest person to win an Oscar at the age of 11 for her role in the Piano. Now, Paquin has not yet returned to the Oscar stage as a nominee or winner since then, but her career is certainly alive and well. She has done a variety of films, television and feature, that would be considered prestige films, such as Almost Famous, The Squid and the Whale and Bury My Heart at Wounded Knee. Yet, while these films, among others certainly are respectable, I think part of the reason that Anna Paquin is continually considered for a variety of parts like these, is because she has taken moves and opportunities to secure some star power with teen oriented roles like the film She's All That and the X-Men franchise. By playing teen roles, I think she took herself from the world of "young Oscar winner" to "teen star" paving the way for her to edge her way into non-teen roles that are still age appropriate, including her most recent turn in the popular role of Sookie Stackhouse in True Blood, for which she has won the Golden Globe and Satellite Award. I hardly think Anna Paquin's film success ends with her HBO series, rather I think her acting ability, along with ability to redefine her filmography at each step of her own age suggest to me that she is a very talented and adaptable actress. Now if only, Haley Joel Osment could land himself a role on 90210 or a teen oriented film he might be able to bring some luster back to his career that really kicked off in full swing with his Oscar nominated role in The Sixth Sense. "When's That Princess Movie Coming Out?" "When's that Princess moving coming out," my wife will ask me every so often recently. I remind her it's coming out in December and she asks/tells "We're going to see that, right?" 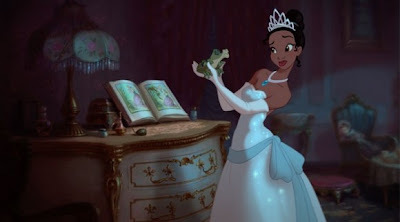 My wife has been very interested in The Princess and The Frog, largely because she is very excited about a new Disney princess movie with the look of traditional animation that lines up with her favorite Disney films (Aladdin, Snow White, Cinderella, Beauty and the Beast, Sleeping Beauty). Her interest in this film is undeniable. At the same time, when I am read post by people discussing their thoughts on this films success, it seems like the consensus is that this film will be a failing, in a world where 3D and computer animated graphics are a significant figure in the studio and theater grosses. Yet, I think this pessimism towards this film might be somewhat unfounded. Sure, it might not grab the same crowd that has Ice Age 3 and Monsters vs. Aliens in the top 10 for 2009 box-office grosses. It seems to me that this film might capture a similar crowd, that fell in love with Enchanted. My wife typically does not show an interest in any animated films, but the "classic-Disney-style" and princess narrative is creating interest. The last Disney film that had this animation style was the 2004 flop Home on the Range. When here people compare Home on the Range, the farm film that grossed just barely $50 million domestically, I think they are missing the difference. So to my wife, and the other girls like her who want to see Disney re-embrace this drama, show Disney you love them. 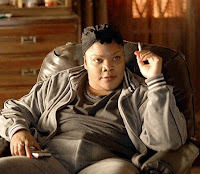 See the movie, bring your book club, your nanny circle, and your church choir. Stop at McDonald's on the way and get the happy meal toy, and maybe even buy some Princess Tiana toys too for the neighbor kids, otherwise...it might be the end of the Disney Princess Films. I recently returned from a vacation, and thought I would share a couple thoughts from my experience as it relates to this blog in the coming days. But before I do that, I thought I would mention how watching TV is almost no fun when you are stuck on an airplane. Maybe it's just me because I don't watch tons of live-TV anyways, but when I'm stuck on the airplane, the option to watch direct TV certainly makes the time fly faster, but, what is there to watch? Another episode of watching people buy a house of HGTV? But the most painful was watching Kathy Lee Gifford and Hoda after the today show. 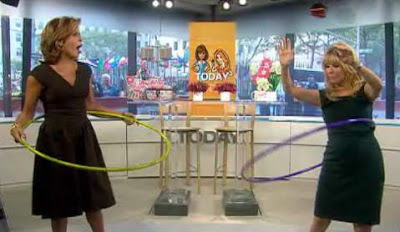 In response to Michelle Obama hula hoop video, they hula hooped. They talked about Jude Law in Hamlet (Hoda didn't get Hamlet). Then they talked to Willem Dafoe, but most of the interview was about how is creepy (in reference to his body of work including his most recent film Antichrist). It was all pretty painful, even the price is right is painful on an airplane...sorry Drew Carey. On my flight out there I watched a film I never have seen before, the box-office success Lethal Weapon 4. I would like to criticize this film, but it was alright, it was entertaining and even though TBS had ten thousand commercial breaks about George Lopez' new show, it was alright because...I was stuck on an airplane. And little did I know how much better this was then Kathy Lee Gifford and Hoda. 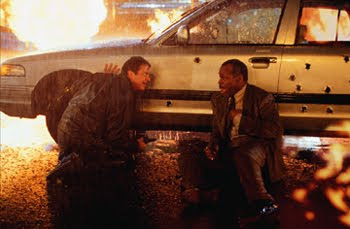 Lethal Weapon 4 has the "buddy" element that is still popular and present in comedy, and Mel Gibson & Danny Glover are able to match the tone and flair of this police-comedy genre. Plus, Lethal Weapon 4 has a respectable role François Chau, aka the Dharma Initiative guy from the videos on TV's Lost. I think sometimes we don't take the young actors and actresses in teen films seriously enough. No, I'm not talking about teens with breakout roles who bust out on the scene like Ellen Page in Juno. I'm talking about teens in show up in teen oriented movies that are under the radar, maybe only popular by the teen crowd. My hypothesis is some of the bigger careers for teen stars come out the more "common" and less-acclaimed films. I am going to use a limited sampling of two films from 1999. 1999 had it's share of teen films of all varieties (She's All That, Never Been Kissed, Election, Jawbreaker, But I'm A Cheerleader, American Pie, Detroit Rock City, The Blair Witch Project, Cruel Intentions). 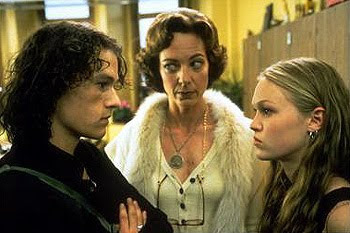 But in addition to these, my favorite that year was 10 Things I Hate About You which stared Julia Stiles, Heath Ledger, Joseph Gordon-Levitt, David Krumholtz, Gabriel Union and Larisa Oleynik. Yet there was another 1999 movie that wasn't a teen film but stared some strong teen roles, and that was the popular Oscar-winning film American Beauty. Teen stars who deserved their praise included Thora Birch, Wes Bentley, and Mena Suvari. As for 10 Things, we know that some of these actors, particularly the males all have established their own film identities and are respected in their roles and career, the most obvious being the late-Ledger but even Krumholtz headlines his own television (Numbers). Oleynik never really busted out and Stiles while gaining teen momentum hasn't seemed to break from that yet, and it's hard to imagine what her career has in store. As for the American Beauty teens, I think in my heart I am waiting for all three of them to establish themselves as common and identifiable actors who don't need to be tied to their 1999 success. I truly believe the talent is there and they are more than one-trick ponies. 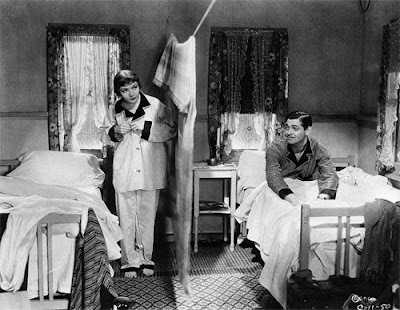 But despite some various credits none of them have had that stand out role to make them household names. I think to be honest you have to say that more consistent stars probably came out of 10 Things I Hate About You then American Beauty. Talent might be debatable, but stardom and bankability does not. It seems like the secret to post-teen stardom is using the platform of your previous roles to land you a role in other films, but not to limit yourself to your previous success. Most teen stars get more roles, but what they do with those follow-up roles makes all the difference. Teen stars have to move out of the teen scene and reinvent themselves. In recent years, in addition to someone like Ledger, Keira Knighley (Bend it Like Beckham) or Anne Hathaway (Princess Diaries) have tried different things that have established them as post-teen actresses. I think many times we fail to notice the teen acclaimed performances and anchor on those as the potential stars of tomorrow, but the reality is that some of these more popular less-acclaimed performances could be the true stars of tomorrow. Just as Michael J. Fox, Christian Bale, Reese Witherspoon, and Sean Penn (that guy from Fast Times at Ridgemont High). And I think we all know it never hurts to be on the Mickey Mouse Club. So maybe we should be more proactive and open to thinking about the High School Musical kids as potential stars, or any other new face that enters the Hollywood teen romance or comedy scene. These truly could be tomorrow's next stars. It seems like welcoming a baby into our family last year stunted my ability to catch as many things in a theater as I was previously accustomed to. As a result sometimes I find myself slightly time delayed in seeing some of the films I'm only half-interested in seeing. So, I was thinking about the 2008 film scene, and as 2008's films have come out, some people that may have watched the Oscars saying "what are these films" have now had the chance to invite these films in their home with the convenience of however they view post-released films. So, I was looking at IMDb's top 250 films and curious what currently (today) is on the #250 from 2008 and where it ranks. Of course, this list is imperfect in many many ways and often captures niche audiences, but for fun here's what 2008 films make IMDb's list, post-DVD release. I think time will kick some of these off the list as more people see these films, some will probably stay on the list. This list is interesting because I think it lines up closer with some of the films that might have made the cut if the Oscar's had a 10 film best picture race like that do this year. Notice of the 9 only 2 best picture nominations are present. Have you seen by now what audiences have ranked the best of 2008? How do you think this will adjust over time? (I know my votes are different). One of the interesting things about watching a season of a television show on DVD is that you are watching it with the absence of time. By this I mean that if it's fall sweeps and shows are bringing in big name celebrities, you might not realize it until you watch a couple episodes in a row that have a different type of "marketed flair" to them. Even more noticeable then sweeps is the Christmas episode. What makes the Christmas episode(or in some cases episodes) different is not just the decorations and holiday related banter. No, it's also the tone of these episodes. They tend to me more relaxed, less stressful, and in the end they give you a feeling of peace, that all is well. For no show is this different more clear then in Fox's hit medical series House. Dr. Gregory House is known in this show to be harsh, impersonal, offensive and callous in his approach towards his staff and his patients. He operates on the theory that all people lie, and that medical diagnosis is a mystery detached from the person who the disease is effecting. 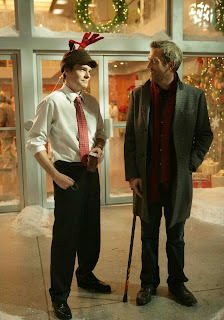 All the same, every time I watch a season of House on DVD there is always an incredibly disappointing Christmas episode, an episode smack dab in the middle of the season where House is nicer, and if he's not a lot nicer, everyone around his is so sugary sweet. Not only that, House usually learns a lesson, or has a heart-warming moment. Ultimately these stories usually end with providing a sense of peace. Sure in October and January everything can be awful and the show can explore harsh realities and trauma, but not for it's December episode. No, this is the episode where Wilson helps House feel just a little bit of the Spirit of Christmas. It's interesting how this seems to make the episode sub par. In fact, it's disappointing to me, because I want film and television to explore this theme. Yet the only way I can understand that is in terms of how the theme of peace distracts from the nature of good narrative, which is explored and developed conflict. In the discussion of peace, I most recently addressed the idea (using superheroes as an example) that in order to present peaceful characters on screen you still need conflict. In terms of story telling at it's most basic core. whether it's a true story or a fictional stories, we learn that all stories must have conflict. 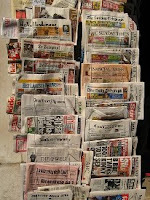 When I was in college I had many journalism-major friends. One of the challenges of writing a news story is that all stories must have conflict. If you are writing about a town hall meeting, an exceptional athlete, a new medical discovery, or anything else, a good news article should have conflict. Or...as we usually hear it, the article should "show both sides of an issue." Without this conflict, news becomes propoganda or human interest stories about three legged dogs. When I was in high school I remember the popular short story "The Most Dangerous Game" by Richard Connell (adapted to film over a dozen times). The story is about an experienced Hunter/killer General Zaroff and his human hunting expedition to hunt down New York hunter Sanger Raisford. When we read this story, this story was used to introduce the concept of narrative conflict. We were told all stories have at least one type of conflict. So if all stories - real or fictional must have conflict, how can you make a film about peace? Even if you were to do a peace film about Mother Teresa, a person, who has never had her own big-screen biopic, you couldn't just have a two hour film about her helping people, there would have to be plot. You'd have to see issues like people stopping her from helping them, there would have to be the struggle with death, faith, and government forces. There would have to be personal struggle, frustrations, and questioning. These elements would not eliminate the film being about peace, but when you walk away from a film about a high-level concept like "peace" you'd have to also wonder and ask questions like "was it worth it?" or "did it make a difference?" and if the film doesn't make you ask questions of that nature, you will probably feel manipulated or as if you had watched a piece of common propaganda. So to present a concept like peace in film means you have to open the film up to also be about conflict. Practically an opposite. This to me, makes peace a challenging concept and theme for any sort of narrative art, because even when the end result is peace, it did not come without struggle and conflict. In the discussion of peace, I wanted to argue that films that are popular are rarely about peace, and if they are they are hardly successful. But then, I thought about it some more and wanted to correct my earlier position. As it stands I would suggest that one of the most popular genres - the Superhero genre is largely wrestling with the idea of peace. Most superheroes are ultimately fighting for peace. And it is in that one word the dichotomy of peace arises. For every superhero there is an long list of supervillians and even common villains who are at hand fighting against the cause of peace. So whether it's New York City or Gotham at risk there is conflict of good vs. evil and evil's only intention is to destroy peace, and in some way, evil brings good down to it's own level by forcing violence. Characters like Doctor Xavier from the X-Men series and Spider-Man truly represent some concepts of peace, who want to use their super abilities for good not evil. Of course, this frustrates the evil and here's where the fun, the exploding national monuments and the other-worldly combat comes in. These films with themes of peace also are the same films that get the Oscar nominations for the loud explosions, fast cars, and combat noises. Otherwise, I challenge you to find a poplar film about peace that isn't one of these superhero films. About a year ago, I discussed how in financial insecurity we have a great opportunity to give. One of the ways my wife and I put this thought into action was through contributing to a small micro loan for a man in Togo, Africa who needed a micro loan for construction. I donated through the organization Kiva.org and wanted to provide a status update, that at this time 75% of the loan has been paid back and on schedule. My wife and I have recently been looking for opportunities to bless others that we know and don't know in various ways, and we thought of our construction friend Kokouda Baba and decided we would like to give another microloan. Tonight we have decided to give to a woman, married with three young kids who sells beans, and is currently struggling because her supply does not meet her customer's needs. 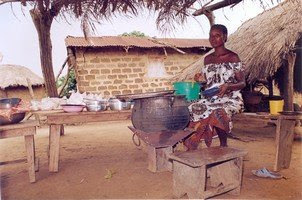 She also lives in Togo (Agbélouvé) and her name is Adjo Akpan. At the time of writing this Adjo's $900 loan is 78% funded. I hope she get's funded soon, you can help. In our discussion on peace, I think security and opportunity are a big part of peace, especially when it comes to global peace. I think the Nobel Prize committee was wise in recognizing this idea when they awarded Mohammed Yunus the peace prize in 2006. Yunnus founded Grameen Banks of Bangladesh which provides micro loans fighting poverty and creating opportunity in Bangladesh. I think there is a strong case for Kiva founders Matt Flannery and Jessica Jackley to someday win the Nobel Peace prize, what they are doing could bring peace in a strong way. Perhaps the active form of creating peace is often giving. Giving of ourselves, time, and resources to ensure a better well being for others. Not mandated giving, but true generosity. I know I could do better at creating peace, especially to think about how I can be an instrument for peace in the lives of those I will never know or meet. I think it was about the time when Clint Eastwood made Flags of Our Fathers and Letters From Iwo Jima that it finally clicked. I saw war film differently. I realized that almost all war films are anti-war films. I remember this being discussed with Eastwood on multiple occasions when these two films were released. How can some of Hollywood's most violent films (no doubt, Letters from Iwo Jima along with many of the films below are quite violent) be the one's that are against violence the most? 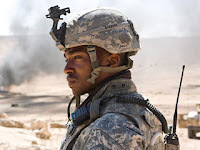 Yet, these films seem to present perspectives that show war is unnecessary pain, where people often sacrifice so much for so little, or that in the midst of war lose essential perspective to live like humans. No quite patriotism in the normal perspective. In a way, anti-war is about peace because it's fighting against what takes away peace. But for a world that still can remember a cold war, or sees the challenge of nuclear weapons on the global stage, no war is not peace enough. Today Barack Obama, the community organizer from Illinois won the Nobel Peace Prize. This high honor was a shock that was welcomed by some and despised and criticized by others in the United States and in the world. Peace is not a popular topic. Not because of lack of importance, or even lack of caring. But it's so big. It's unmeasurable, and some how the line between peace and war is surprisingly thin. And so when it comes to awarding one person or organization for "peace" well...what in the world does that even mean? Obama has been president of the United States for less than a year, so how can you determine his overall peace contribution? Of course this is the debate. And I think most people will clearly argue this premature. But what do you expect in less than a year as president? I kind of like to picture Obama waking up one day, dressing in a white robe with olive branches and started spreading fairy dust over the globe and said "peace to you" before spinning around in circles. No, Obama has increased military presence in Afghanistan, been involved in increased civilian death counts in Pakistan. And just in one year. But the award is more for his aspiration of peace, rather than his implication. It's for his dedication to reducing nuclear weapons and restoring strained diplomatic relationships. And suddenly when peace is just a word that some people associate with hippies, Christmas carols, and sleeping babies, we begin discussing it again. So, I kind of wonder - where is there peace in our pop-culture? Do our films represent peace? How about music? TV? And if you can think of an example of contemporary Peace presented in art, is it effective, engaging, or something people are drawn towards? One of the on going complaints of Hollywood is not enough roles for women. But then when a film does have roles for women, there's often more than one from a film who's got a chance for awards recognition. 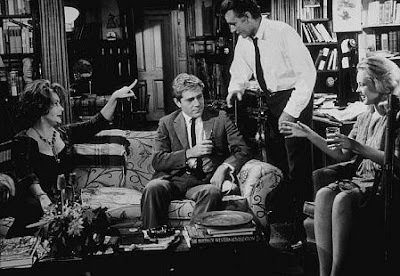 Films in the past have had multiple nods in the best actress category (and the 1963 film Tom Jones had three supporting actress nominees). This year seems to be one of those internal competition years where both, either, or neither female supporting ladies could score nods. This years internal competition - and my prediction in the face-off. Face-off Prediction: Both are knocked out in round one. Face-off Prediction: It could go so many ways - let's say Dench and Cotillard knocks the other three out? And the Cotillard takes care of business? Who knows. Supporting Actress Predictions Coming Soon! Care to weigh in? If you're an Oscar prognosticator, or even someone tracking opinions of what's going to be "critically acclaimed" come year end, you've probably heard of the film which often carries the long title Precious Based on the Novel Push by Sapphire. This film has been in the award buzz spotlight since it's Sundance film festival awards early in January. At Sundance earlier in the year it won the Audience Award, Grand Jury Prize for dramatic feature, and special jury prize for Mo'nique. This film with it's heavy content seems like it might mix up the Academy Award nominee's from being limited to skinny white girls with British accents. Pretty impressive potential for a film of this size and theme. Check out the preview here for a better idea of what this film is all about. 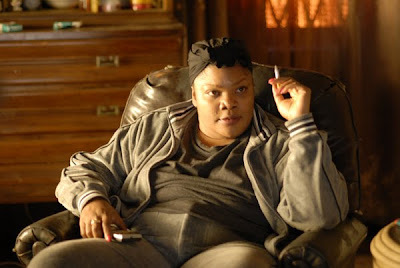 No doubt, it has a heavy story line and probably not a huge box office take, but it's hard to tell what Tyler Perry, Oprah Winfrey, and critical acclaim can do. Did Dorothy Eat One of My Favorite Apples in Oz? Thank you to everyone who recently shared in my apple snobbery and even suggested some new varieties to hunt out. In doing some apple research, I began to wonder what type of apple Dorothy Gail was reaching for in the land of Oz. 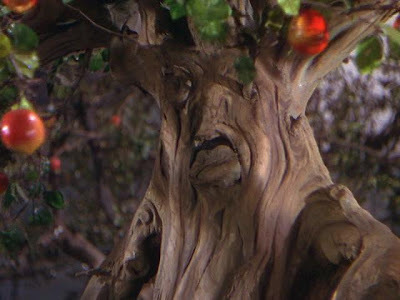 In this 1939 film, I can tell you that the apples in the wizard of Oz weren't my favorite, Honey Crisp (an apple that wasn't "developed" until 1974). It's weird to think of apples of having days they were created/developed/introduced. Apparently there are over 7000 types of apples, and while no apple has an origin or creation in Oz, I've decided that Dorothy was not attempting to eat one of my favorites. Sure Gala and Granny Smith were both introduced prior to the films release, there colors are not quite the same color as the bright shiny color we see in the film. 5. Granny Smith: Originated in Australia in 1868. "The walls of Jericho will protect you from the big bad wolf." Andrew at Encore Entertainment mentioned in my most recent post about the Big 5 (Picture, Director, Lead Actor, Lead Actress, Screenplay), mentioned his interest in seeing a film getting a nomination for all four acting categories. So in short...probably no chance unless the Academy doesn't just love one of these films but wants to throw everything it can at one of these two films. Side note: No film has won in all four categories, and 4 of the films listed above actually had 5 nominations due to double nominations in a category.